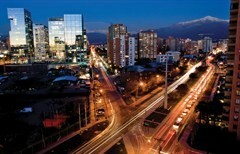 The tender process is commencing for the Américo Vespucio Oriente expressway (AVO) in Chilean capital Santiago. The US$940 million tender is due to be awarded in February 2014. The 9km highway link will connect El Salto with Príncipe de Gales Avenue and will feature three lanes running in either direction, with a design speed of 80-100km/h. An underground section of this urban highway looks likely to be constructed using the New Austrian Tunnelling Method (NATM) while it may also include a section in an open trench and a stretch built using cut and cover techniques. The highway was originally intended to run for 13km between El Salto and the Rotonda Grecia. However the Chilean Government decided to shorten the link by 4km in a bid to reduce costs as the original design would have cost in the region of $2 billion. The construction work will commence in 2016 and the highway is expected to open to traffic in 2020.